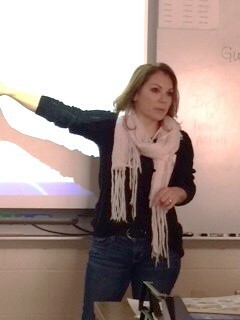 Jenifer Cole, a representative from SAS, spoke with 7th Grade students at Spring Hill Middle School currently enrolled in Exploring Business Marketing and Entrepreneurship on Friday in celebration of Computer Science Week. Mrs. Cole talked with students briefly about her responsibilities with SAS and followed up with a YouTube video from a 60 Minutes feature of SAS. She then took them through an HTML coding activity where students were able to create an actual web page including a text area, and a button. She ended with a short question/answer session. The students were very interested and excited to learn about coding, computer programming as a career and the benefits that go along with being employed with SAS.